Specialty front loader hay handling attachments. These attachments require that the front loader bucket be removed to install unit. Download the literature. 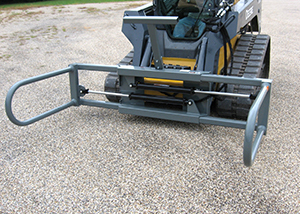 SSLBS-48 Large Square Bale Squeeze for skid steer loaders and tractor front loaders that use the industry standard “universal” skid steer quick-attach system. Unit handles wrapped / unwrapped large rectangular bales as well as round bales. Features one manually adjustable arm and one hydraulically controlled arm. Handles bales from 48” to 96” in length, up to 2,800 lbs. Cylinders, hoses, and connect under pressure couplers are standard. Shipped less hoses. Item #834170, 665 lbs. Bale squeeze for large rectangular bales, wrapped / unwrapped. Both arms open hydraulically to handle bales from 48” to 96” in width, up to 2,800 lbs. Unit handles wrapped / unwrapped large rectangular bales as well as round bales. 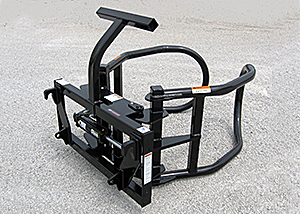 Mounts to skid steer loaders & tractor front loaders that use the industry standard “universal” skid steer quick attach system. Unit is shipped with cylinders, hoses and connect under pressure quick couplers. Item #834200, 715 lbs. GLBS-48 Large Square Bale Squeeze for tractor front loaders that use the Euro/Global quick-attach system. Unit handles wrapped / unwrapped large rectangular bales as well as round bales. 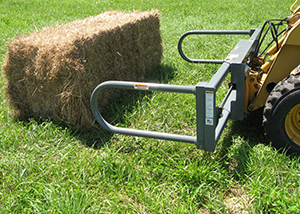 Handles bales from 48” to 96” in length, up to 2,800 lbs. Hydraulic cylinder included. Shipped less hoses. Item #834180, 680 lbs. Designed for tractor loaders with the Euro/Global tool carrier. Both arms open on this bale squeeze to gently handle wrapped / unwrapped large rectangular bales as well as round bales. Arms open 48” to 96” and can handle bales up to 2,800 lbs. Unit is shipped with hydraulic cylinders, less hoses and couplings. Item #834210, 730 lbs. 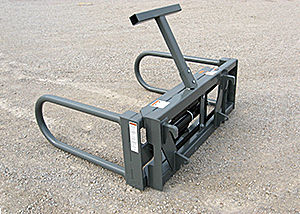 UBH-2072R - Rotating Bale Hand rated at 2,200 lbs. for round bales 4-6 ft. Both arms open to clamp the bale. Includes cylinders (less hoses). Optional interfacing brackets for most loaders are available. Not for 3-pt. Item #832990. Weight 705 lbs. GLBH-2072R - Rotating Bale Hand for tractor loaders with the Euro/Global quick attach. Rated at 2,200 lbs. for round bales 4-6 ft. Both arms open to clamp the bale. Includes cylinders (less hoses). Item #832985. Weight 735 lbs. 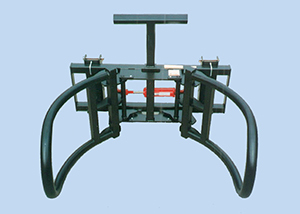 JDBH-2072R - Rotating Bale Hand for JD 400/500 Series quick attach systems. Rated at 2,200 lbs. for round bales 4-6 ft. Both arms open to clamp the bale. Includes cylinders (less hoses). Item #832975. Weight 740 lbs. SSBH-2072R - Rotating Bale Hand, Skid Steer mount. Rated at 2,200 lbs. for round bales 4-6 ft. Both arms open to clamp the bale. Includes cylinders (less hoses). Item #832995. Weight 730 lbs. 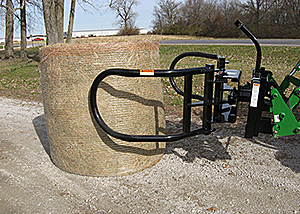 SSBH-2072 Skid Steer Bale Hand rated at 2,200 lbs., it is designed to handle 4-ft to 6-ft diameter round bales. Both arms open to gently clamp wrapped or unwrapped bales. Item #832965, 572 lbs.